The pool designer created a simply elegant poolscape by combining a vanishing edge with the rounded edges of a geometric shape. Added bonus: the far-off vista is invited to play a larger role in the setting’s tropical splendor. While being spontaneous can be a good thing, building your long-desired swimming pool should not be left to chance. Today’s designers have a variety of pool shapes and styles in their portfolios, from freeform pools and infinity edges to Grecian styles and classic rectangles. What is best for your property will come from a number of inspirations. But before you get to this step, consider what material will be best to construct the pool design you have in mind. 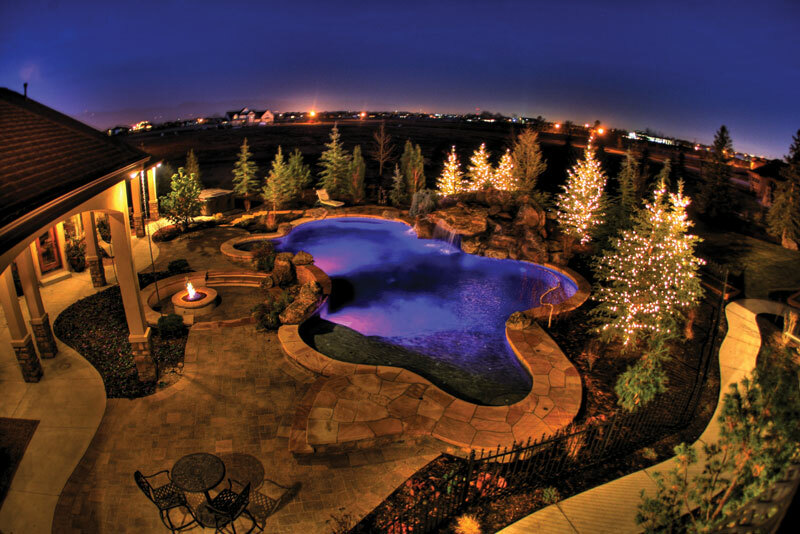 There are three basic types of inground pools: concrete, vinyl, and fiberglass. Each type of building material has its own set of pros and cons when it comes to forming a shape and creating a style. Make sure the design you imagine for your pool can be fabricated in the material you want to use. Don’t hesitate to do your homework: research options, ask other pool owners, and interview prospective builders of all three types. Concrete is the most accommodating material for crafting a pool shape and style: your imagination and your budget are its only limits. Ideal for any kind of custom design, you can further enhance your concrete pool with a finishing material like glass tile, colored plaster, or stone aggregate. Vinyl, like concrete, is great for all types of swimming pool designs. The material and styles for vinyl-lined pools have advanced over the years; the number of patterns and colors are almost infinite, giving homeowners a large assortment to choose from for the look of the pool’s interior. Built from pre-manufactured molds, fiberglass pools come in a wide variety of colors, shapes, and styles, including popular designs like infinity pools. Fiberglass pool companies can further customize your project by adding ceramic tile, custom jets, mosaics, and other water features. Once you have decided on the type of construction and chosen a professional builder, the next step is to flesh out the concept. Take a look at these popular pool shapes to learn how they are best used. Then when you consult with your designer, you’ll have a better idea of which options can be accommodated. This classic rectangle with an infinity edge is a definitive illustration of how a pool designer creates harmony within a setting—plus, it proves that traditional does not mean unexciting. Infinity pools (also called vanishing-edge or negative-edge pools) are one of the most dramatic effects found in pool design. Made to fool the viewer into believing that the pool flows over an edge into the neighboring vista, this type of swimming pool is actually a product of math and science: the water flows over the pool’s weir wall into a hidden trough where it’s recycled back into the pool. Homes that overlook spectacular scenery like the ocean, a river, mountains, or even nearby cityscapes are the best candidates to capture this design’s magic. However, a designer will also suggest an infinity pool for a property that is surrounded by natural lushness like wooded glens or palm tree groves. This deck-level perimeter-overflow pool includes one side that works like an infinity edge, taking full advantage of the property’s oceanfront view. Perimeter overflow pools are an optical illusion that uses water to mimic mirrors and flat deck surfaces. Water overflows on all sides into a trough in the deck, functioning like a 360-degree vanishing edge. When viewed from overhead or from afar, the pool appears to be a flat surface on the deck. It is only when the wind or some other movement ripples the surface that the effect disappears. Concrete, vinyl, and fiberglass pools can all incorporate infinity edges and perimeter overflows into their designs. 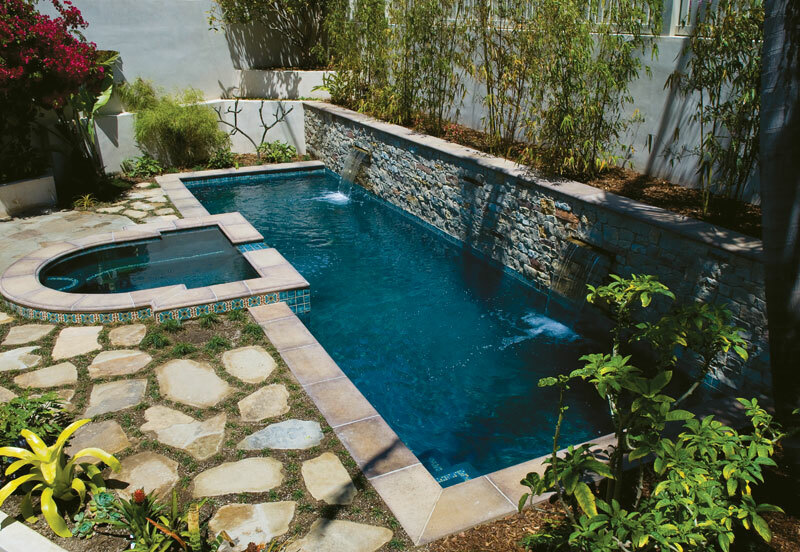 With the right landscaping and design touches, a lap pool becomes a beautiful outdoor oasis. If your home is luxurious and traditional, then a classic rectangle is one of the best options as the pool’s straight lines will not overpower the property’s ageless elegance; in fact, those clean edges will reinforce the architecture’s magnificence, creating an even greater aura of sophistication. But don’t let your imagination stop there. Rectangular pools are the little black dress of pool design. In fact, many designers prefer to use this shape for non-traditional homes because it never goes out of style and will always coordinate perfectly with its surroundings. Rectangular pools can fit into a variety of locations, including contemporary, urban, and pastoral. When joined with an infinity edge or a perimeter overflow, this type of inground pool shape takes on even more character and allows the pool to truly become one with the setting. In addition to gracefully enhancing a home’s property, a rectangular pool can also be put to work. Many people enjoy using the pool for exercise and swimming laps. A lap pool is an excellent option for those who want more out of their pool than a place to dip their toes or float away the day. Built to accommodate a swimmer’s strokes and turns, a lap pool can be whatever length and width the user deems necessary. But don’t think that your pool must be utilitarian in looks—use your professional pool designer’s flair for the visual and keep the aesthetic around the pool in line with the rest of the property so the pool can also be the home’s showpiece. By simply changing the design to create an “L” shape, the pool can be the best of both worlds: for those swimming laps, there is the straightaway, and for those wishing to play water volleyball or basketball, there is a separate wading area for fun and games. When surrounded by trees and lush landscaping, freeform pools easily mimic natural waterways. Freeform pools live up to their name: Because their contours do not have to obey the rules of geometry, they can become whatever the designer visualizes, making them ideal for most properties. Homes in natural, tropical, or rustic settings are exceptional candidates because freeform pools blend in seamlessly with their surroundings, morphing into the setting and appearing to be organic in origin. With imaginative landscaping, hardscaping, and lighting, a freeform pool can mimic a tropical lagoon, a secret oasis, or a tranquil waterway. Freeform pools are also excellent choices for homeowners who want to incorporate a pool into an asymmetrical space that is already developed. The designer will finish the pool to match the surroundings, thus keeping the poolscape in sync with the entire outdoor space. 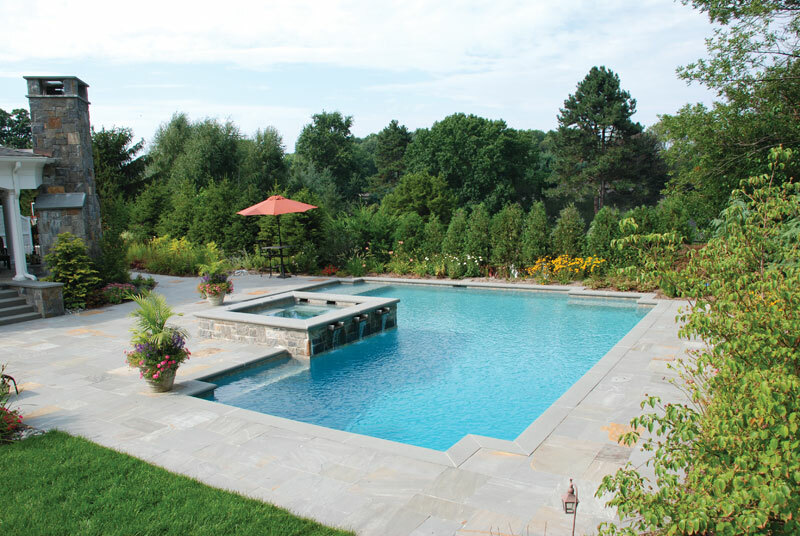 This pool is a great example of the prototypical L shape blending in within a natural setting. Photo courtesy of Creative Master Pools, Inc.
Geometric pools rely on mathematics for their sharp good looks, and like the geometric gems created by the cubist masters, they instantly become enduring works of art. Coupled with special design features like fountain bubblers, vanishing edges, overflows, and spillways, this type of swimming pool is the choice for those seeking the ultimate in haute couture. Full of squares, rectangles, triangles, and other carefully formulated shapes, geometric pools are best suited for contemporary or modern properties. They become an extension of the home’s ascetic appeal, providing the perfect counterpart to the property’s overall beauty—which is the reason why geometric pools also work well in desert or other Spartan environments. This perimeter-overflow pool demonstrates how geometric pools can enhance desert or other austere settings. Normally, one would think that a freeform pool would work best in a lush setting, and while this is true, a geometric pool’s ability to complement an often austere setting is one of the reasons that many designers gravitate to this type for desert homes. 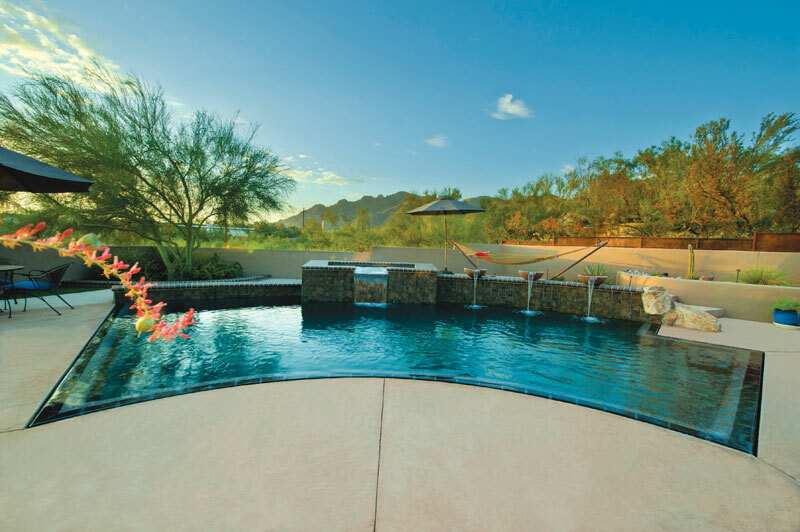 Against the browns and tans of an arid backdrop, a geometric pool works in the same way it does in a modern or contemporary setting: it enlivens the environment’s simple splendor. To make it really pop against the neutral tones, many designers finish this type of inground pool in vivid, sparkling glass tile or splashy hues of plaster. Custom-shaped pools are one-of-a-kind retreats, and this one achieves its uniqueness by harmonizing with the home’s architecture. Some homes require a unique look that goes beyond the common pool shapes: they need something that is completely their own. Most often, a homeowner gives the pool designer carte blanche to create a one-of-a-kind poolscape that incorporates every nuance and element found on their property. Usually, these types of pools are built from concrete because this versatile material can accommodate every size and shape that can be imagined. For instance, if your home overlooks magnificent panorama like an ocean or a graceful mountain range, you may want your builder to combine the magical effects of an infinity pool with a freeform lagoon style. Over the years, homeowners and designers have let their imaginations fly: guitar-shaped, fish-shaped, even car-shaped pools have been the result. Designers have built cantilevered pools off the sides of mountains, creating breathtaking infinity pools that belie gravity. They have also created meandering pools that mimic lazy rivers and “invisible-sided” pools that appear to be floating on air—the options are limitless. Custom pools are for the homeowner who is fearless and ready to create a poolscape that has never been seen before. The retro good looks of a kidney-shaped pool can be used with a variety of architectures, which makes it a go-to design for many homes. If you peeked over the fence of every home that has a swimming pool, you will notice that quite a few sport a kidney-shaped pool. 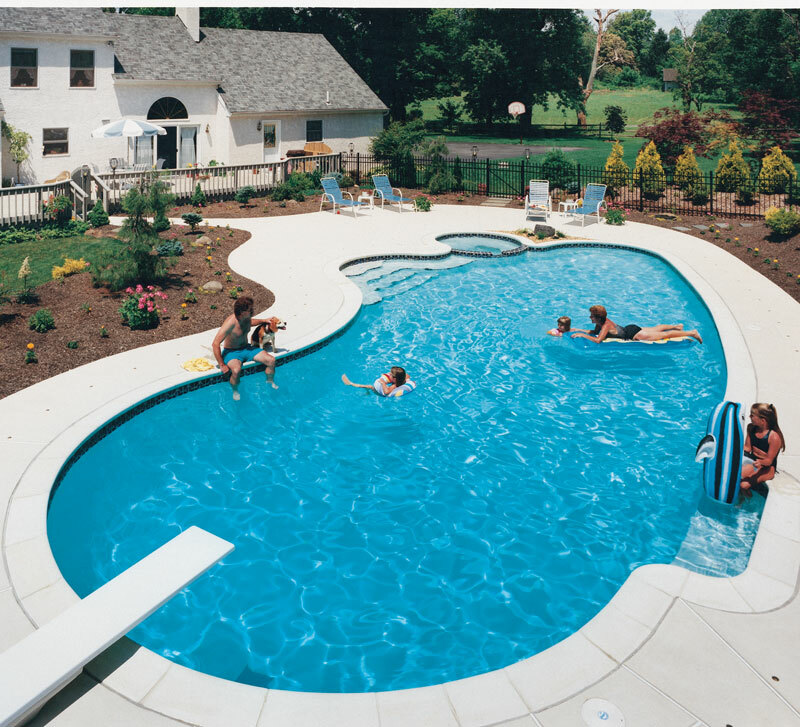 The reason is simple: kidney-shaped pools’ soft, retro look is appropriate for a variety of architectural styles. Many pool designers use this pool shape as a foundation from which to build more elaborate structures. No matter the building material, they will add accents like natural coping, glass tile, colorful plaster, or a textured finish to customize the project for your property. 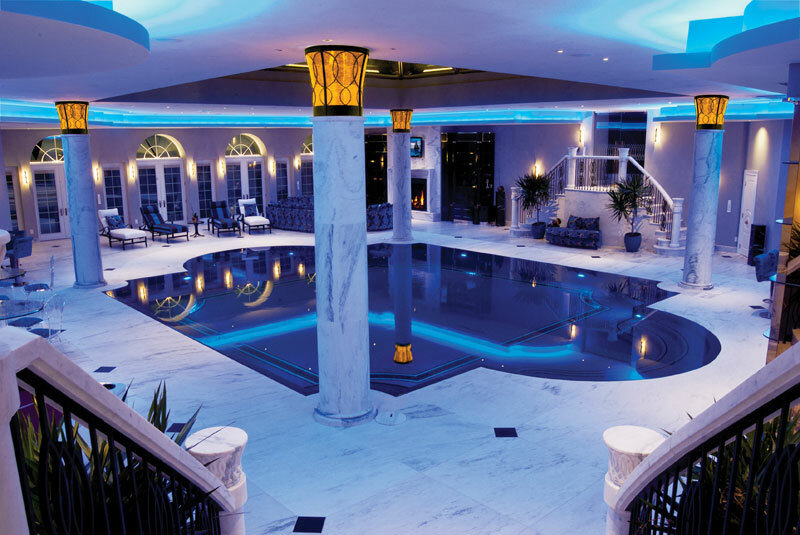 This Roman-shaped perimeter-overflow pool is easily the focal point of the richly appointed room. Grecian and Roman style pools are classic rectangles gone wild. Mirroring the formal elements found in ancient art, these pools start out as rectangles and then get pushed and pulled into something completely different. Grecian pools have cut corners, forming an octagon, while Roman pools have stylized corners and rounded ends. Both types blend in with a variety of homes, but especially those of Tuscan or Aegean heritage. When finished in a colorful glass tile and framed with Travertine coping or decking, one can easily mistake either one as a relic from another era. In the end, the swimming pool needs to be shaped for you and your property. When your project is done, there should be complete harmony throughout the space. The home, the inground pool, the outdoor structures and the landscaping that frames your backyard should all be in sync with each other. Then, when you look around your new favorite spot, you can applaud your designer and builder—and yourself—for a job well done. Grecian style pools stand the test of time and fit in with all types of properties.